In addition to our guardian angel, each of us has "helper" angels, who have specific duties in our lives. The most significant of these helpers is your home or house angel, who protects your home, family, pets and any land you may have. 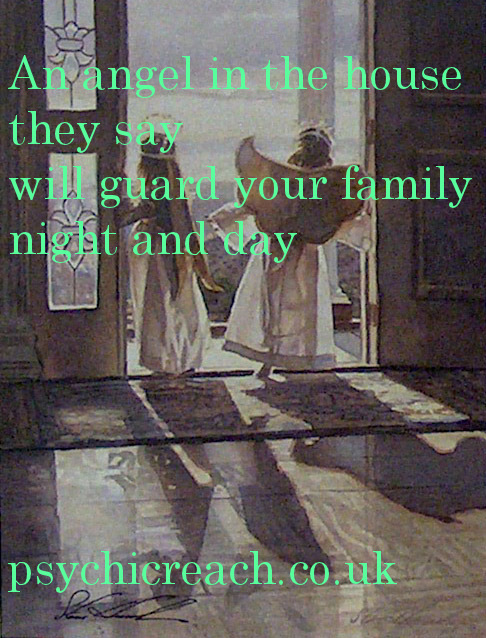 In pre-Christian times, the angels of the home were referred to as, "the guardian of the place". The belief in house and home guardians still exists in many countries, especially in eastern Europe, the Baltic regions, Russian states and Scandinavia. Few people in modern rural Sweden will undertake renovations without asking permission of the house spirit or angel. In Iceland official road planners will go round a land-guardian rock rather than move it, and certain field are regarded as sacred and so are never used for housing or industry. Christianity acknowledged these protective domestic energies and assigned particular angels and archangels to watch over the home. The following list is by no means comprehensive, but these are the home guardians still most invoked in today's world. * The fiery protective archangel, Chamuel or Camael protects your boundaries. * Green-robed Derdekea guards home, family near and far, land, pets and property. * Menadel, with his silvery light, guides you and loved ones home each night. Each home has its household angel and even if you never consciously connected with yours, you may have sensed a protective presence at times, perhaps when you heard a strange bump or bang in the night - as if to reassure you all was well. Household angels tend to bring practical help, but are also very protective of children, and will often comfort them should they have a bad dream or wake suddenly in the night.